There is "healing facilitation" and then there is "wholeness facilitation." Knowing the difference can make a huge difference in your level of health and well-being. I love hearing comments like this. It’s gratifying to know I had a role in facilitating someone’s well-being. It’s gratifying to know that I can. Those I serve are even more grateful to be free of their pain and difficulty. It wasn’t always that way. It troubled me to see people suffering. When I was younger, there was not one thing I could do about it. Oh, I could sympathize. I could console. I could run errands for them, and such. This kind of support has its place and is welcomed by those in need. But those efforts didn’t resolve the real issue. They still suffered. I wanted to do more. Perhaps you can relate. 1) It must promote positive, lasting change. 2) It must be versatile enough to be effective on a variety of conditions. 3) It must produce tangible benefits even if the cause is unknown. 4) It must promote well-being without harmful side-effects. 5) It must be holistic, working with one’s natural healing ability, enriching one’s whole being rather than only addressing symptoms. That’s what I love about Do’Hai™, the form of spiritual healing facilitation I teach and facilitate. My experience indicates that Do’Hai easily meets all these requirements and more. In fairness, Reiki and many other “alternative” healing modalities may meet similar requirements. But many practitioners address only conditions without regard for cause. While they may achieve satisfactory results, more can be done without added effort. It’s a matter of training, attitude, and intention. Once initiated and certified, Do’Hai Facilitators can assist people to align with the supreme healing presence of their own Soul, the Source within. It contains your “Divine Blueprint,” the design of your whole and perfect Self. Your Soul understands the cause of any conditions you may suffer from. And It knows the solution that’s right for you. Do’Hai makes it much easier for you to allow Soul/Source to act on your behalf. Thus, solutions begin to manifest more quickly and with greater ease. A more accurate way to describe Do’Hai is “Wholeness” or “Oneness” facilitation. Regardless of the problem, Wholeness is the solution. Greater health and well-being are priorities for many people. Both are aspects of wholeness. But lack of wholeness (fracturing) can manifest in ways not typically associated with health. Strained relationships, difficulty concentrating, financial woes, even a fender bender, or dropping and breaking a drinking glass are some examples. There’s a reason for each of the conditions where they exist. But they are unlikely to be an expression of your Wholeness. With Do’Hai, you can transform these areas of life as well. Here’s one of my favorite examples to illustrate the point. Someone called to cancel an appointment with me due to an unexpected financial setback. I invited her to call when she when she was ready to reschedule and then I offered to “send” her a boost of Do’Hai to support her through her process. She readily agreed. After we spoke, I spent about ten minutes facilitating Do’Hai on her behalf. She called the next day to schedule, bubbling over with delight as she reported that her money problems were solved. “It was truly amazing! Came out of nowhere,” she said. I didn’t know the nature of her financial setback and had no idea how to solve it. But I did know Do’Hai could help her access her financial wholeness. And so it was. While receiving Do’Hai and while facilitating for myself, I have wonderfully clear and insightful meditations. I find that intentions I set tend to gracefully become a part of my life experience. People I’ve facilitated have had headaches and other discomforts dissipate within minutes — like the person whose quote begins the article. Many experience restored peace, hope, and well-being long before their session ends. In some cases, Do’Hai recipients report that within days of their session, some positive shift just “clicks” into place for them. 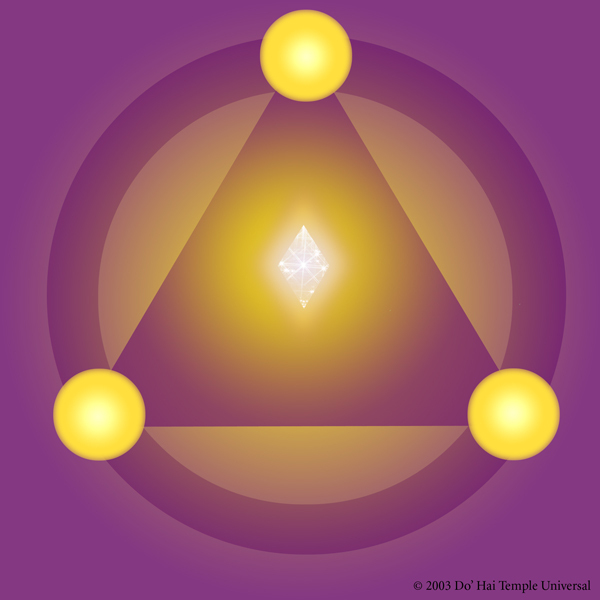 And with that shift comes insight and inspiration supporting their intentions. Easy is good. Graceful is good. Real progress — that’s fantastic! There are other profound benefits in learning how to facilitate Do’Hai. If you receive wellness services, you may reduce expenses by facilitating yourself. If you provide or want to provide wellness services, Do’Hai facilitation can be a rewarding, income-producing practice. You may also have family, friends, pets, and plants you’d like to support in achieving wholeness. For these reasons and many others, Do’Hai makes a wonderful wellness tool. This powerful healing art is perfect for those who want a simple and effective way to improve their lives and the lives of others. Somra and I (Jaraan) teach Do’Hai Healing Facilitation. We also facilitate Do’Hai sessions for those who want to improve their health and well-being. Go to http://soulgate.byregion.net for information and scheduling. Be sure to read our events listings and subscribe to our newsletter for ongoing articles and updates.